Anyone who has been to Sprague Lake, knows that it is usually very windy there. These strong winds make it difficult to capture a reflection in its waters. On this autumn morning, when I arrived at the lake, I was amazed to find that it was nearly perfectly still. A storm was moving in but there was a small crack on the eastern horizon allowing the sun to transform the dark clouds into a glowing canopy. 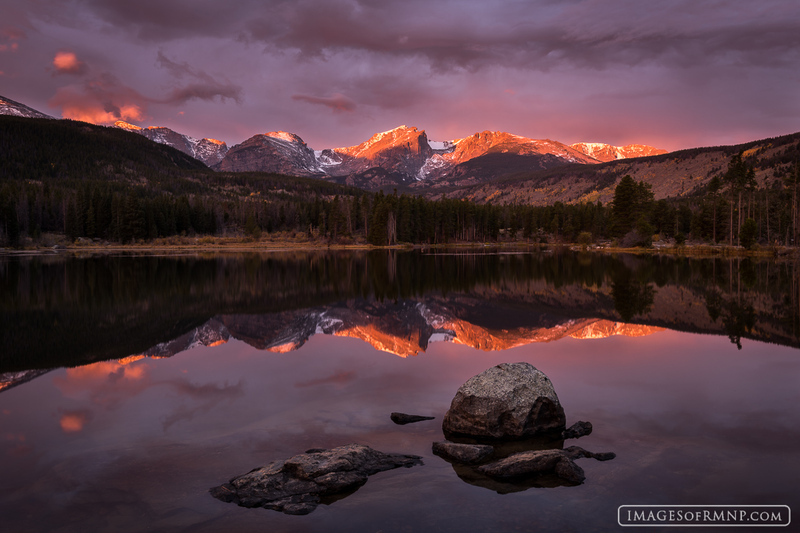 The end result was a dramatic and spectacular sunrise on one of the most beautiful lakes in Rocky Mountain National Park. Photo © copyright by Erik Stensland.